Greetings from Queenstown, New Zealand….wish you were here! 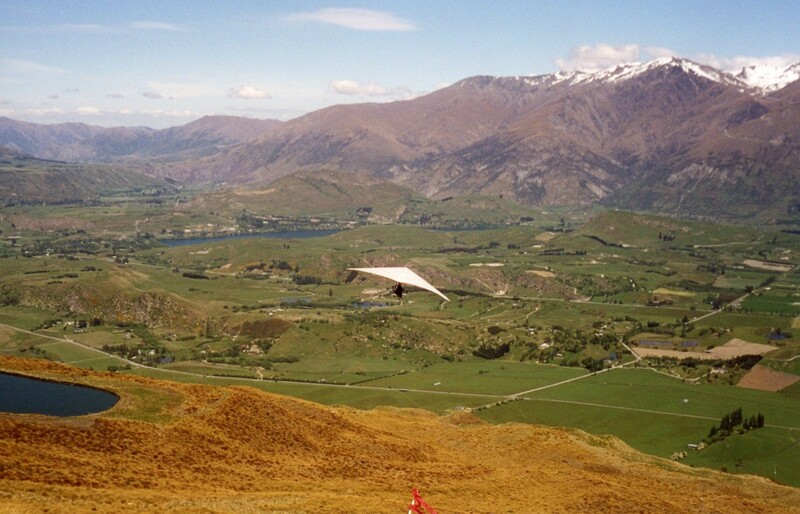 Photo taken in November 2001 in Queenstown, New Zealand. I made him go first. I had to. I was so nervous, scared out of my mind and anxious about actually going through with this ride that I thought I’d make my loving, wonderful husband of one year take the first jump off the mountain. All I could think of was how the booking agent told us that the other day there had been “a wee bit of drama”. An accident occurred in which a woman and her “driver” fell a couple hundred feet and didn’t take off. Instead of landing safely on the bottom, they wound up in the hospital with lots of broken bones. But amazingly enough, they were ok. I watched him and the driver run, and gracefully take off the edge of the mountain soaring like a bird through the stunning blue sky. It looked crazy. I still had time to change my mind. Twenty minutes later they arrived back on top of the hill. My husband wore a big, satisfied smile across his gentle face. “How was it” I asked, terrified. “Oh, it was awe-some!” he replied easily. “Was it scary”? I asked skeptically. “Not at all. In fact, it was quite relaxing. You’ll love it!” he replied encouragingly. Ok. I’m doing it, I decided confidently. I got hooked up to all the protective gear next to Steve, our Canadian hang-gliding driver and off we went. “Run, Run, Run” Steve hollered. Clumsily, we ran as fast as we could and magically the giant wings of the hang-glider began to take off and up, up, up we went. I screamed bloody murder, at the top of my lungs! What in God’s name was my husband talking about?! This was anything but relaxing!!!! It was the must frightening, exhilarating feeling I’ve ever experienced in my entire life. I screamed for at least the next ten minutes until I finally was able to relax and realize that I wasn’t go to die. Instead, I giggled and laughed at the realization that I was flying like a bird, taking in all the remarkable beauty of Queenstown and the towering Remarkables in the background. 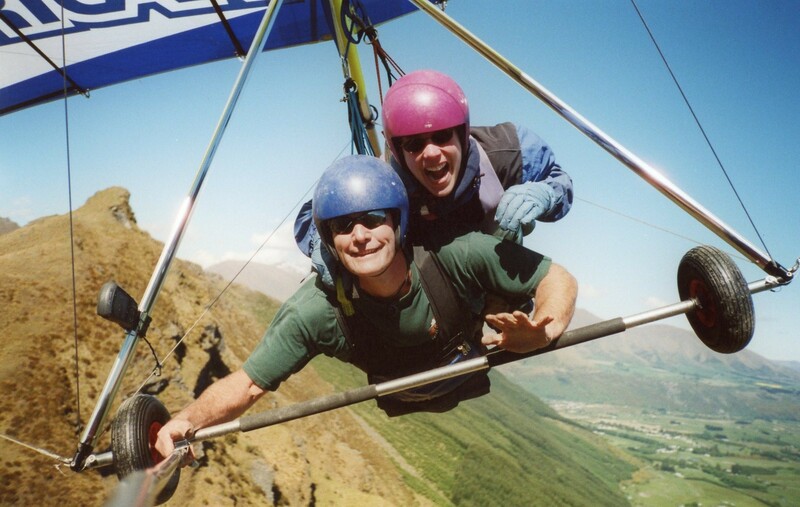 The hang-glider had a camera tied to the wing and the pictures of my ride were priceless. As we safely landed, circling like an airplane, I breathed a big sigh of relief and threw my arms in the air in triumph. Steve informed me that I was the most enjoyable, fun passenger he has ever had. I’m sure my screams and giggles were rather hysterical. I was hysterical. I’m glad I did it, but I wouldn’t do it again! The things we do when we are young and free. As they always say: CARPE DIEM! Seize the day. I wish I’d done that when I was there. Sounds incredible!!! Love the pic of you screaming!